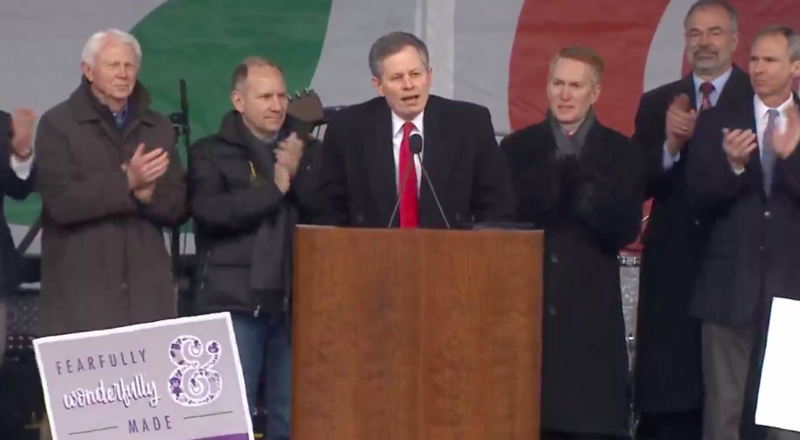 Republican Montana Sen. Steve Daines announced Friday during the March for Life rally that he is forming the first ever pro-life caucus in the United States Senate. “We’re finally going have in the Senate what the House has had for many years, so that the House and the Senate can work together on having a more strategic approach in how we’re going to move pro-life policies to the president’s desk,” Daines told the National Review prior to the rally. “This will allow us to bring the pro-life groups that work off the Hill, as well as pro-life senators and other staff on the Hill, to unify us so we’re all pulling in the same direction to advance the pro-life cause,” the Montana senator continued. Daines explained to the National Review that the caucus will focus primarily on judicial confirmations until Republicans have the necessary 60 votes in the Senate to override the legislative filibuster.